Circuit Playground Express is a microcontroller board that's packed with goodies. Check out this Guided Tour for all the details. It's designed to work with 3 different programming languages. There's so much to learn with this board! This project code will be written using CircuitPython. On the CPX, will utilise the micro USB port, capacitive touch sensors, the slide switch, the 10 Neopixels and the onboard speaker. 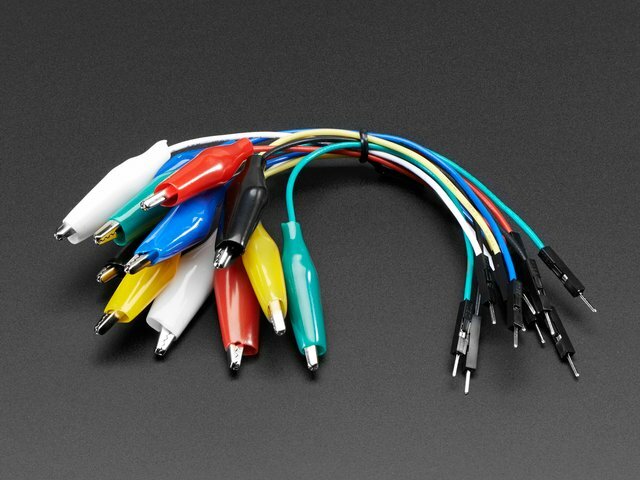 Plug your micro USB data cable into the micro USB port on your CPX. The port is at the top of the board to the right of the power indicator LED. Around the outer edge of the CPX are a fourteen alligator-clip friendly pads. Within the fourteen, are the seven capacitive touch pads, labeled A1-A7. We'll use these to generate tones and lights. The speaker is on the lower left side, above the music notes. We'll use this to generate the tones using the touch pads. There are 10 NeoPixels in a ring, just inside the ring of pads. We'll light up these LEDs to go along with our tones. Next, you'll install CircuitPython on your Circuit Playground Express and get started with CircuitPython. 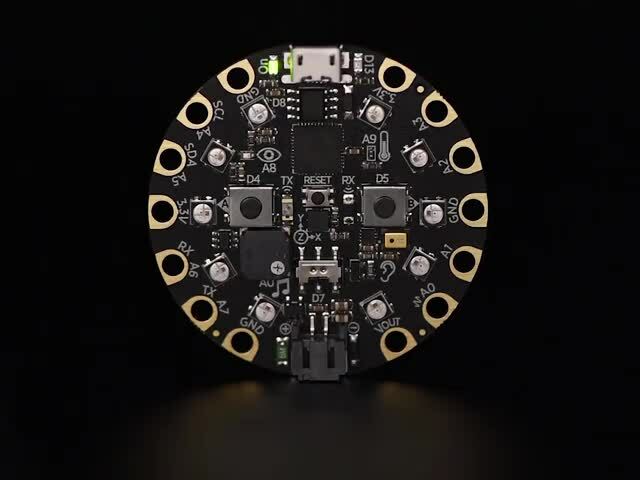 CircuitPython is a derivative of MicroPython designed for a particular set of Adafruit microcontroller boards, including the Circuit Playground Express. It's a new language and is currently in development, so there will be changes to it in the future, including many things to make programming your CPX even more incredibly easy! CircuitPython looks for a file called code.py, and runs the code within automatically. It makes getting started quite straightforward. CircuitPython also allows you to connect to a serial REPL which provides you with a way to see your code working live as you save your files. It also provides you with a prompt where you can enter lines of code and execute them immediately. In this part of the guide, we're going to cover how to get CircuitPython installed on your Circuit Playground Express and you'll write a little CircuitPython yourself! Installing CircuitPython is simple. Basically, you download the latest release of CircuitPython, double-tap the reset button to enter the bootloader on the CPX, drop the .uf2 file onto the board, and CircuitPython is installed. If this is the first time you've installed CircuitPython on your CPX, you only need to press the reset button once to ready the board for the installer. For a thorough explanation, the Introduction to Circuit Playground Express guide offers a CircuitPython quick install walkthrough and, if desired, a CircuitPython detailed install walkthrough. Check them out if you need further information. They're really helpful! Congratulations on installing CircuitPython onto your Circuit Playground Express! Way to go! Once you've installed CircuitPython, you need to load the library. First, you'll want the latest release of the library bundle. Scroll down to "Downloads" and download the file starting with "adafruit-circuitpython-bundle-2.x" where 2.x is the most recent version of CircuitPython. It's currently 2.1! The file unzips into a folder called lib. Create a lib folder on your CIRCUITPY drive, and drag the adafruit_circuitplayground directory from the bundle lib folder to the newly created CIRCUITPY/lib folder. You will run into memory errors if you copy the entire contents of the lib folder to your CPX. You can also checkout the Adafruit Library Bundle Quick Start Guide for more information. CircuitPython sends data to the computer connected to the Circuit Playground Express. You can see the output of print statements and any errors you encounter along the way by connecting to the serial REPL. To get started with the serial REPL, check out the tutorial here: Serial Console (REPL). This covers setup on Mac, Linux and Windows. While this project can be completed without using the REPL, the code is written to give you live feedback through the serial connection. It can be really helpful for troubleshooting problems! This is a Python prompt. Here you can type any python code and have it run. To learn more, take a look at the Introduction to Circuit Playground Express Circuit Python section. The guide covers all the basics and provides plenty of examples to try and learn from. Check it out! Circuit Playground Express has 10 Neopixels in a ring. They're numbered 0-9 starting at the top left pixel, next to the micro USB port, and going counter-clockwise around the board. Each pixel can be individually programmed to display any color, or they can be programmed together. Each NeoPixel LED contains 3 colors: red, green and blue. The colors are collectively referred to as RGB. When working with colored lights, every color is created from these three being combined at different levels. If only the red is turned on, you'll see red. If red and blue are turned on equally, you'll see purple. If all are turned on equally, you get white. We're going to use this process to add a color of the rainbow to every note on our tone piano. Let's start by turning on the first Neopixel. We'll turn it blue. Download the following file. Rename it to code.py. Copy it to your CPX. You will be rewarded with a blue pixel on your CPX. The first line has two parts. The first part is the module. This is different for different types of hardware. As we're using the Circuit Playground Express, we're all good there! The second part of the first line imports the information from the module needed to make the code do what it does. This line will be part of all of the code we use for this project. It's necessary for the board to understand the rest of the code we write. The second line is telling the CPX to turn on pixel 0, and to make it blue. The colors are written using RGB, which ranges from 0-255. It is the combination of the RGB numbers that change what color is displayed, based on the ratio of the three numbers. The higher the number, the brighter that individual color is. If you change  to any number 0 through 9, you can turn on any one of the NeoPixels. If you change the numbers in ((0, 0, 3)) to any number 0-255, you'll change the color and brightness each NeoPixel displays. You can include more than one NeoPixel by adding another line of code with the number of the desired pixel. The following code lights up the opposite pixel as well. Try editing your code.py file to add the additional line of code. You can add more pixels or change the colors of the two we've already lit. Have a little fun with it! For this project, we're going to turn all the NeoPixels the same color. We use a different color for each tone. For now, we'll start by turning them all blue. If you made any changes to your code that you'd like to keep, rename your current code.py first. Then, download the following file. Rename it to code.py and copy it to your CPX. The difference between this code and the first set of code is, instead of specifying an individual NeoPixel by number, we are programming them all at once to display the same color, by using cpx.pixels.fill. You can experiment with different colors again by changing the ((0, 0, 3)) to numbers between 0-255. Next, we'll learn about the slide switch. It turns out, when you program the Circuit Playground Express to utilise the capacitive touch for sound, it makes sound pretty much every time you touch it. This is great for the project! However, it can be incredibly frustrating if you're simply trying to move the board or unplug it. To alleviate this issue, we're going to use the slide switch to have the option to mute the tones. To begin, move the slide switch is to the left. This is the off or mute position, or as the board and code reads it, "True". Rename your current code.py if you made any changes you want to keep. Download the following file. Rename it to code.py and copy it to your CPX. We've again imported the module from the library file on the first line. Then we have something new: a while statement. while True: essentially means, "Forever do:". while True: creates a loop. When there is a loop, the code will forever go through the code inside the loop. All code that is indented under while True: is "inside" the loop. Inside our loop, we have an if statement. An if statement says, "if this event is happening, do the following." Our code says, if the switch is to the left, or True, print "Slide switch off!" This is followed by an else statement. And else statement says, "Otherwise, do the following." An else typically follows an if. Together they say, "If this is happening, do this first thing, otherwise, do the second thing." Our code says, when the switch is to the right, or False, print "Slide switch on!" The True and False are how the slide switch knows it's location, and do not necessarily reflect the purpose you may assign it. Next, we're going to learn about the capacitive touch pads and adding sound. This guide was first published on Oct 20, 2017. It was last updated on Oct 20, 2017. Keep track of your YouTube views and subscriber counts with this TV shaped display!